“Don’t shave there- the hair will only grow back faster darker, and thicker!” Such is the wives tale about the effects of cutting hair. Does cutting hair have any affect on the hair’s future texture, colour, length or quantity? No, but that doesn’t stop the spread of this and other wives tales about hair. 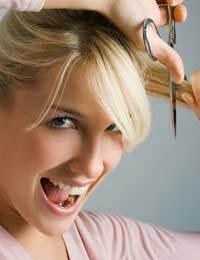 “Cut hair grows back faster” is the basic concept behind this wives tale, although there are plenty of variations. Shaved hair is sometimes the culprit, and sometimes it matters very specifically what part of the body from which hair is being removed. Many wives tales are created to curtail undesired activities (such as lake monsters to keep children away from the water), but in the case of this hair raising tale, there is some physical evidence that could have given rise to the idea. Hair naturally tapers at the end, growing thinner the farther you follow a strand from the base to the end. Looking at the end of long hair and then looking at the results of a close cut it would appear as if the newly shorn locks are thicker and darker. They are not, but the thicker and darker parts of the hair have been uncovered. Likewise new hair growth is tougher and more resilient than longer hair. From here it is easy to see how people could look at hair growing back from a shaved patch of skin and say it is darker, thicker and tougher than the hair that was there pre-shaving. There are a lot of other hair related wives tales as well as this one. One hundred strokes of the brush is supposed to stimulate healthy, thicker hair- but excessive brushing actually pulls out hair that wasn’t ready to go. A person’s hair growing grey from shock is one (can’t happen) as well as a grey hair plucked leads to more grey hairs in the future. This one is sort of true, or at least it appears to be. A new hair takes about six months to grow out, which means the person who plucked the offending hair is six months older, and likely to have more grey hair anyway. It’s just the catalyst that is wrong. One more bit of proof that plucking, cutting, and shaving hair does not cause more hair to grow- were this to be the case, there would be a lot less bald men in the world. In one episode of the TV show “Seinfeld” Jerry succumbs to the temptation to shave the hair on his chest. His neighbour, wild man Kramer, pleads with him to stop, telling him that he will start down a road that can only end in madness. For proof he lifts his shirt (off camera) to show the results of his own shaving fetish and Jerry’s horrified reaction assures us he has been shocked to his senses. He doesn’t stop, however, and later maddened by the itching of the hair growing back in, runs off howling in the light of a full moon. Hi, it indeed doesn't grow back thicker, if haid grows actually thicker there are other causes. The curiousity is why does it grow back at all right away? As it is a stable length before we shave, then it grows back and stops again at that very same length, just more stubbly because it's cut blunt :). Does hair realize someway it's being cut? Not that there's anything wrong with it, would be just nature's way, but in theory shaved hair should only grow back later after being shed, not right away, just curious. The story about the tick:The way we used to do it was we would take a match and light it and put it near the tick which warmed it and then they would back out. We did not touch them with the match. This worked. Nowdays I would then use an essential oil like purification on the open wound. When you are camping this can be done quickly. I am not a doctor.